To Phyllis Monk, teacher and founder of Chorleywood School. From Peter Foale. What a remarkable woman you were. Born in 1885 south London, you were one of three children of George and Annie MOnk and the granddaughter of Hans Monk, a Danish sailor. You had a very successful school career at Blackheath High School where you ended up as Head Girl. We still have a lovely set of leather bound volumes of the works of the great poets that you won as school prizes between 1897 and 1904. After that you went to Girton College, Cambridge. Going to University was highly unusual for women then. After all, it would be more than twenty years before all women over 21 had the vote, something that I know you fought for. 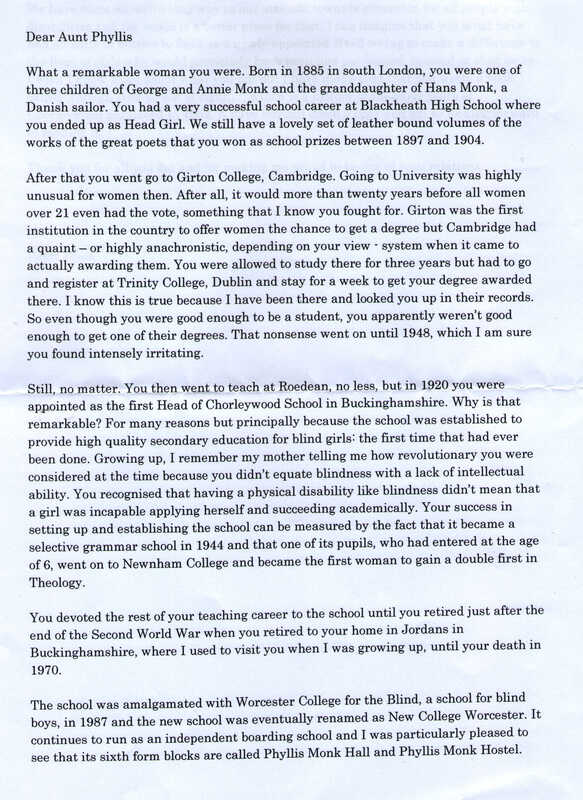 Girton was the first institution in the country to offer women a chance to get a degree but Cambridge had a quaint – or highly anachronistic, depending on your view – system when it came to actually awarding them. You were allowed to study there for three years but had to go and register at Trinity College, Dublin, and stay for a week to get your degree awarded there. I know this is true because I have been there and looked you up in their records. So even though you were good enough to be a student, you apparently weren’t good enough to get one of their degrees. That nonsense went on until 1948, which I am sure you found intensely irritating. Still, no matter. You then went to teach at Roedean, no less, but in 1920 you were appointed as the first Head of Chorleywood School in Buckinghamshire. Why is that remarkable? For many reasons but principally because the school was established to provide high quality secondary education for blind girls: the first time that had ever been done. Growing up, I remember my mother telling me how revolutionary you were considered at the time because you didn’t equate blindness with lack of intellectual ability. You recognised that having a physical disability like blindness didn’t mean that a girl was incapable of applying herself and succeeding academically. Your success in setting up and establishing the school can be measured by the fact that it became a selective grammar school in 1944 and that one of its pupils, who had entered at the age of 6, went to Newnham College and became the first woman to gain a double first in Theology. You devoted the rest of your teaching career to the school until you retired just after the end of the Second World War when you retired to your home in Jordans in Buckinghamshire, where I used to visit you when I was growing up, until your death in 1970. The school was amalgamated with Worcester College for the Blind, a school for blind boys, in 1987 and the new school was eventually renamed as New College Worcester. It continues to run as an independent boarding school and I was particularly pleased to see that its sixth form blocks are called Phyllis Monk Hall and Phyllis Monk Hostel. We have come an awful long way in our attitude towards education for all people with disabilities and the world is a better place for that. 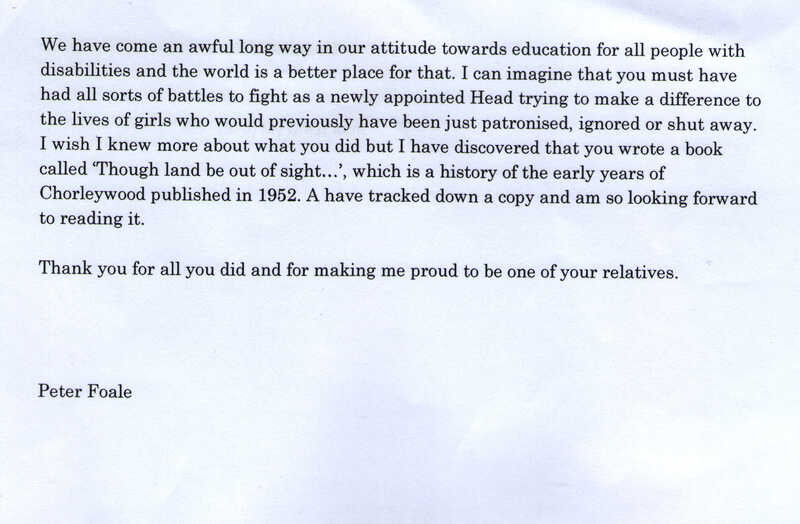 I can imagine that you must have had all sorts of battles to fight as a newly appointed Head trying to make a difference to the lives of girls who would previously have been just patronised, ignored or shut away. I wish I knew more about what you did but I have discovered that you wrote a book called “Tough land be out of sight…” which is a history of the early years of Chorleywood published in 1952. I have tracked down a copy and am so looking forward to reading it. Thank you for all you did and for making me proud to be one of your relatives. teacher and founder of Chorleywood School. Born 1885, died 1970.